This entry was posted in Computing, Rants and tagged Changes, Computing, Rants, rss by Les. Bookmark the permalink. Feedly issued an update today which made it a bit nicer to use – you can now sort feeds alphabetically for example. 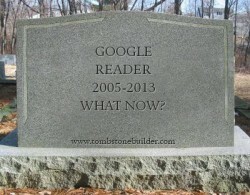 I still don’t think it’s quite up there with Google Reader as was, but it’s improving. I agree with you about Newsblur though – it tries to be too many things to too many people. I paid for a premium account (when you could get one for $12) but I don’t think I’ll be renewing it. Google reader? Is that like Adobe reader? I’ve also looked around to find something that could work for my 300+ feeds, and I hated alll the ones you’ve tried. So far I’ve landed on Bloglines. It imports your feeds without any trouble and let you sort them into folders and order them the way you want. The default setting is with widgets, but there’s a nice little slide-button on the top that takes you to the reader setting, so that’s the only one I ever see. It’s not perfect, but the best I’ve seen so far. Digg says they’re building a great rss-reader, so I’ll keep an eye on them too. I recommend Taptu. Easy to use…. Very large choice. Les, have you considered Tiny Tiny Rss? It’s like hosting your own copy of GReader and has some sharing features built into it or easily available via plugins. I’ve got to go with Mark. Just finished installing it on my server and it’s great. Simple, clean and functional. Doesn’t seem to have a “recommended” type functionality (unless I’m just not seeing it) but other than that, it’s a perfect replacement (for me, at least). I’ve glanced at Tiny Tiny RSS, but haven’t tried it out yet. Given that I obviously have a webhosting account I probably should (and probably will).